applications up to quite recently. it has been found to be very harmful to your health if disturbed intentionally or unintentionally. It damages the lungs causing mesothelioma. 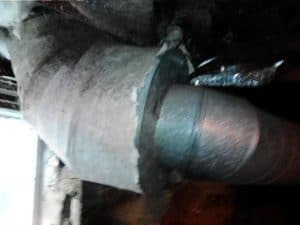 Undisturbed the asbestos is harmless, disturbing it loosens asbestos fibers that can float in the air and get inhaled which is why it is good to know what you are dealing with if you suspect asbestos. Asbestos was used because it makes a great fire or heat barrier as well as having excellent insulating qualities. sealing the joints or as a wrapping with a whit/gray coloring and resembling a heavy cloth. Old boilers covered in a white plaster may be asbestos laden as well as the hot water pipes supplying the radiators. Sheeting was often positioned above old furnaces and boilers to act as a heat shield for the ceiling. 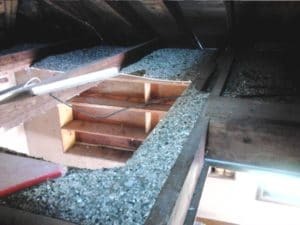 Vermiculite was a commonly used attic insulation. The product looks like it might be crushed stones in the attic with gold and silver flecks in it, some vermiculite is asbestos laden, some not. testing is required to determine the type. 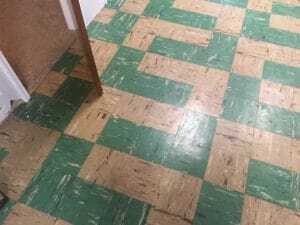 70’s was not vinyl but linoleum. This was not only used in the basement (where we often see it) but also in the bathrooms and kitchens and sometimes through the home. It looks like heavy solid “vinyl” floor tile in houses. Exterior siding that was made of large shingles that appear to be concrete may also be an asbestos product. Sampling is easy, and results are available in 2 to 4 days from the lab.